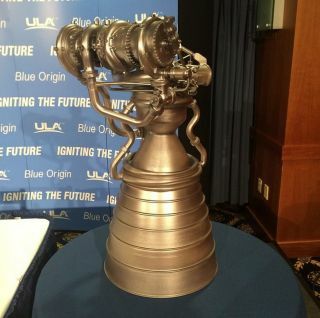 A model of Blue Origin's BE-4 rocket engine is seen on display, Sept. 17, 2014, at the National Press Club in Washington, DC. The secretive private spaceflight company Blue Origin and the launch provider United Launch Alliance announced Wednesday (Sept. 17) that they're teaming up on a new rocket engine venture. Today, you can watch the joint news conference about the partnership online.